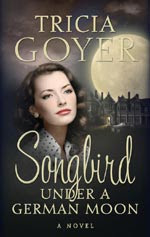 Intrigue, drama, espionage and of course romance, swirl around the story, created by Tricia Goyer - Songbird under a German Moon. The year is 1945. The war is over and 21-year-old Betty Lake has been invited to Europe to sing in a USO tour for American soldiers who now occupy Hitler's Germany. When her first night's performance is a hit, Betty becomes enthralled with the applause, the former Nazi-held mansion they're housed in and the attention of Frank Witt, the US Army Signal Corp Photographer. Yet the next night this songbird is ready to fly the coop when Betty's dear friend, Kat, turns up missing. Betty soon realizes Franks photographs could be the key to finding Kat. Betty and Frank team up against post-war Nazi influences and the two lovebirds' hearts may find the answers...in each other. I really liked this book. Full of intrigue and suspense, the book captured my attention from the very beginning. Betty's story - and the struggle she encountered as she tried to find her own identity in the midst of post-World War II helped make this story "real." As the story develops, we learn more about how Betty came to be in Germany at the end of World War II through lies and deceit. We also see how lies and deceit led to the events surrounding Kat's disappearance. Without giving anything away (no spoilers here! ), the story lives up to it's name and ends with a "song" - after Betty and Frank learn several life lessons, and of course, solve the mystery. If you love World War II, and suspense, then this book is definitely for you! Tricia Goyer is the author of 20 books including From Dust and Ashes, My Life UnScripted, and the children's book, 10 Minutes to Showtime. She won Historical Novel of the Year in 2005 and 2006 from ACFW, and was honored with the Writer of the Year award from Mt. Hermon Writer's Conference in 2003. Goyer's book Life Interrupted was a finalist for the Gold Medallion in 2005. In addition to her novels, Goyer writes non-fiction books and magazine articles for publications like Today's Christian Woman and Focus on the Family. Want to see what others are saying about this book? Click here!